Have you ever experienced that horrible feeling when you’re sick, lost your appetite and didn’t want to eat anything? If you haven’t, you are surely lucky. If you have, however, I do hope you have your favorite comfort food to restore your palate. For me, that would be my mom’s chicken and dumplings. I might be exaggerating a little bit, but that one dish did save me from starvation many times. Back then I would like to think that it had this magical power that could heal any sickness and ailment. In some way, it actually kind of did. So when I moved out, I had to ask her for the recipe. And I am more than happy to tell you that it is super simple to make! Now, what is the original chicken and dumplings? It is one of the classic Southern American comfort food that everyone loves. This comforting savory treat consists of chicken cooked to tenderness, with soft pillowy dumplings and aromatic chicken broth-based soup. I have done some research on its origin, and it is vaguely pointed out on Wikipedia that the dish originated in the Southern and Midwestern US, during the Great Depression; or it might be a French-Canadian dish. Nonetheless, although its origin is still a matter for debate, we can all agree that the recipe is so simple, though it does take a bit of time to make. Originally, in order to make this delicious soup, you would need to cook a whole chicken by boiling it with some herbs and a bunch of vegetables like onions, carrots, and celeries. Those are the key ingredients for a flavorful bowl of chicken and dumplings. The boiling process will take 45 minutes to an hour, depending on the size of your chicken. Once you are done cooking, you will be rewarded with a beautiful, tender chicken and a pot of steaming broth with a mesmerizing aroma. If you have the time, by all means, do it the original way and make your own chicken broth. I promise you it will taste so much better than any pre-made broth. Usually I would prefer taking time to make the chicken broth from scratch, but sometimes, after a long day, I’m just too hungry and tired to wait an hour for it to be cooked. In times like these, we just have to be flexible and compromise. Even though I’m not really into pre-made bouillons, I still have to use them once in a while. The better the broth quality, the more flavorful it will be. So just get the best broth you can find in your local grocery store and you’re good to go. Now, when you’re talking about broth-based soup, there will be a debate about the consistency of the soup. There is no ‘perfect soup consistency’. It all comes down to personal preference: Some people like their soup thick, some like it a little bit diluted. Making a light, liquidy soup is easy. If you want a runnier soup, just add more liquid. You can either add more broth or water. Making a thicker soup is slightly more tricky. And you will soon find out why in the next paragraph. How Do You Thicken Chicken And Dumplings? There are basically two easy ways for you to thicken your soup. The first method would be adding more flour to the ‘roux’. ‘Roux’ is just a fancy name for that flour paste you make when you cook flour in butter. It is often used as a base for many soup dishes and sauces. Usually a simple roux recipe calls for equal portions of butter or oil, and flour. So if you want your soup or sauce to be thicker, increase the amount of flour used when you make the roux. Now if you finish making the roux and add in the chicken broth, but realize the soup is still not as thick as what you aimed for in the first place, don’t worry. You can still fix it with a ‘slurry’, which is just another fancy name for a mixture of cornstarch and water. Just dissolve equal portions of cornstarch and cold water ‒ normally I go with 4 tablespoons of each, and then add this mixture to your simmering pot of soup, a tablespoon at a time until you’ve reached your desired consistency. These thickening methods can be used in many other recipes as well, such as chicken pot pie, gravy, cream sauce, and many more. How Do You Make Fluffy Dumplings? Another key to a perfect bowl of chicken and dumplings lies within the dumplings. A bite from that soft, pillowy, doughy cloud and you’re like in heaven. Getting them right is not an easy task though. On my first few trials, I made them from scratch and the dumplings turned out too dense. They just didn’t have that light texture I was looking for. So I asked my mom for some advice, and apparently I might have gotten carried away and overmixed my batter. When making the batter, once you add the wet ingredients to the dry ingredients, you would want to mix them until you can no longer see any visible pockets of white flour. And just until then. If you mix the batter for too long, you’ll develop the gluten in the flour, which is what makes the dumplings dense, and we don’t want that. Moral of the story: Don’t overmix your batter. 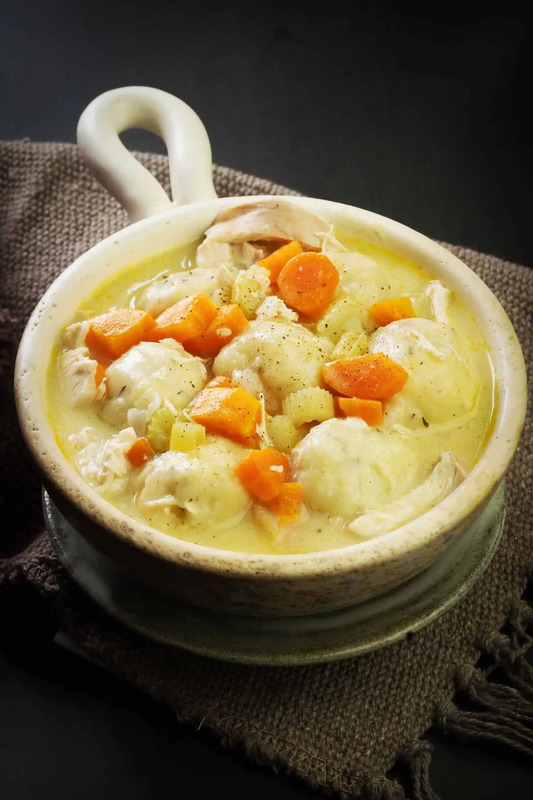 Chicken and dumplings, one of the best comfort foods, an American classic, a friend in need, in sickness and in health. In a large pot, melt 4 tablespoons of butter. Once melted, pour out half of the butter into a small bowl or a cup and save for later use. Add onions to the pot and sweat them for 1 minute. Add carrots and stir to mix. Then add chicken and cook over medium high heat for about 3-5 minutes or until the chicken is no longer pink on the outside. Add celeries and give everything a stir for one minute. Then add the peas and give them another stir. Then add flour and mix it in to distribute evenly. Make sure that everything is coated with flour and that there is no raw flour. Add chicken broth and stir well to dissolve the flour. Then turn the heat up to high and let it boil. Once it starts to boil, reduce the heat and simmer. Then add ½ a cup of milk and the cooked chicken. Season with salt and pepper. In a clean bowl, add the remaining 1 cup of flour, 1 teaspoon of baking powder, 1 teaspoon of salt, and fresh thyme leaves before setting them aside. Then add 2 tablespoons of melted butter to the dry ingredients and stir until the mixture becomes crumbly. Then gradually add ½ a cup of milk and mix until homogenized. Scoop the dumplings out using a spoon and use another one to drop it into the pot. Cover the pot with a lid and let it simmer for about 15 minutes or until the dumplings are cooked and float to the surface. Taste the soup again to check for salt and pepper. Finally, serve in a bowl and garnish with fresh thyme leaves and freshly ground black pepper. Another delicious recipe. I can only imagine how healing this is. What nice memories of your mom making you something to make you feel better. 🙂 Beautiful photos!! Thank you for the detailed recipe with the great cooking tips! I can get clumsy in the kitchen so whenever I make soup, chances are I would add to much water and the soup would be too thin. But thanks to your tips on thickeners, I can now fix that problem! I love chicken and dumplings, but as I tried, the dumplings in this recipe weren’t fluffy enough. But the whole dish was still delicious so it didn’t really matter much. I don’t cook much, and this is the first time I ever made chicken and dumplings from scratch. I think I might have mixed the biscuit dough too much because they turned out kinda chewy and dense, instead of fluffy. But overall, the flavours were nice. I think I’ll try making the biscuits again some time. I know this is a healthy eating blog, so the dish isn’t supposed to be rich and creamy, but a creamless chicken and dumplings recipe just isn’t as good so I’ll give you a 4-star. So I doubled your recipe and made this for a family gathering, and everyone loved it! Well, I did add some heavy cream to the soup because we love rich food. Other than that, everything was great! I made this recipe twice. At the first attempt, I followed the exact recipe and used raw chicken, and I made it with leftover baked chicken breasts for the second time. I think the first attempt was more flavorful. Does searing the chicken in the same pot helps bring out the flavor? Anyway, thanks for the recipe. Okay, I made the soup and it was just too thin for me so I tried the slurry method to thicken it. I don’t know if it’s just me or the constarch gave the soup a starchy mouthfeel. That aside, the flavours were still there, and I love how you write such a detailed article. My kids and husband love chicken and dumplings so I always find new recipes to try and have them do the taste tests. Seems like they really loved yours! The soup is not as rich as most of the other recipes, but that’s a good thing, it just means that it’s healthier!